Our stay in Trinidad turned out to be longer and more demanding than we had envisaged. The plan to spend three weeks touring and a similar time refitting the boat turned into a nine week stay, dominated by some major tasks on the engine, fitting replacement instruments, autopilot, bowthruster, refrigeration etc. Jobs like antifouling, that one expects to feature prominently in the first haul out since we left the UK over sixteen months ago, were almost lost in the noise. Hopefully we have sorted a lot of deficiencies discovered in our first period of intensive sailing and the next haul out will hopefully be a less onerous one. A major improvement in our e-mail communication was also effected by staying in one place long enough to take delivery of a Pactor IIe modem which enables us to send and receive e-mail directly on Amoenitas, using our HF-SSB radio via the HAM network. It works a treat and is so much more convenient than carting our laptop to a phone line but is limited to shorter messages. For the address, see the contact section of our Homepage. Nevertheless we have really enjoyed our stay here; it is a major Caribbean bolt hole from the hurricanes and with around a thousand boats ashore and afloat, it was a wonderful chance to meet up with lots of old friends and make many more. It was a little traumatic at times though. In the space of one week at the beginning of October we were subjected to a serious oil slick, had a very near miss from hurricane Joyce which didn't understand that she was supposed to curve off to the NW, and experienced an earthquake of 5.8 on the Richter scale. The latter phenomena was our first exposure to seriously shaking earth which left a lasting impression. Dave was beside the boat feeling the strong and rapid movements through his feet whilst Di was on deck, trying to get off as quickly as possible before all fell around her. There was an intense noise from shaking rigging but no boats fell over, thank goodness! The fact that Joyce moderated and swerved at the very last moment was held to be yet further proof that 'God is a Trini'! One of the great things about our stay was the opportunity to get out our mountain bikes and do some serious two wheeled exploration. Maqueripe Bay was only five miles away to the north of our Chaguaramas base and a favourite diversion from boat work. The ride took us through rain forest teaming with wildlife like monkeys and parrots, not to mention the odd caiman. There was a bridge on a quiet side road where we were always sure to see several of these reptiles from the alligator family, typically 1.5m (5ft) long. 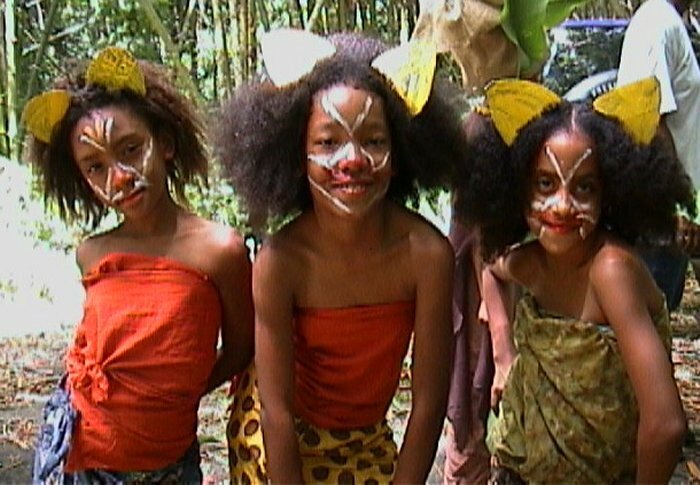 On one of our trips to visit an abandoned NASA spacecraft tracking station, high on a local hilltop, we came across these three girls. They were amongst a party from their school from St James, Port of Spain, having fun making a video about preserving the environment. With it's oil, pitch and gas, Trinidad has greater wealth than most states in the area. The people are warm and friendly with a very rich local culture. They also have some outstanding tropical jungle areas on hills spanning the north coast. These we explored extensively on foot with the Hike Seekers, a local club who were only too happy to let we yachties string along. These were often quite demanding and tiring trips through dense forest, dripping with rain and riddled with steep ascents and descents over slippery mud, only achievable with the assistance of ropes. The redeeming feature was usually a stop at a waterfall for lunch and a plunge into a welcoming pool of clear cool water. This is one such near Maracas. Another chance to explore the riches of the rain forests came in an overnight visit to the Asa Wright Nature Centre, based at a charming old plantation. This is a world class centre staffed by numerous experts where you can see the huge variety of bird, animal and plant life at close range. 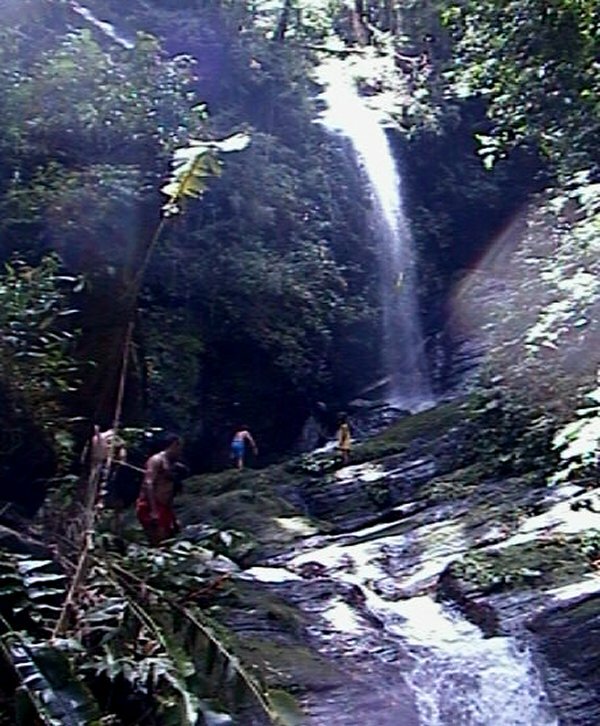 A visit here is a must for anyone with naturalist interests who comes to Trinidad. Here's Di looking out over the forest from the comfort of the verandah. 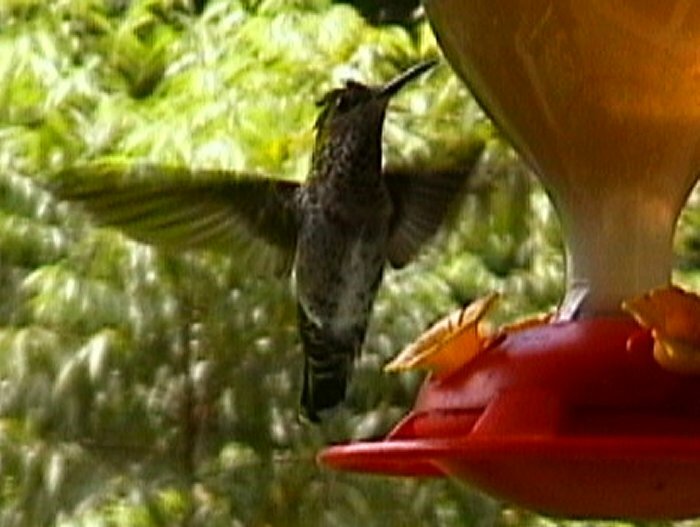 One amazing experience afforded by the feeders was the chance to get close to the hummingbirds. Dave had stalked these with his cameras all over the Caribbean without a chance to get some decent video or still pictures. Here it was relatively easy, given that they flash back and forth for a few seconds at a time, their wings beating at around fifty times a second. The flowers and trees were equally spectacular. So when Kitty,Di's Mum came out to visit for two weeks, Asa Wright was a must for them to revisit. We also took Kitty to the excellent Zoo in Port of Spain. The local forest species displayed there made us more cautious as we saw examples of the boa constrictor, fer de lance and other dangerous reptiles that inhabit the local rain forests. The boatyard complex at Chaguaramas also hosted a profusion of musical talent amongst the cruisers. As one would expect, the sailing community is rife with some of the most interesting and resourceful characters that used to walk the various lands of the earth, until they escaped to wander the oceans. Here's a scene from one of the concerts which are organised by a wonderful and talented couple, Joyce and David from the S/V Mood Indigo. 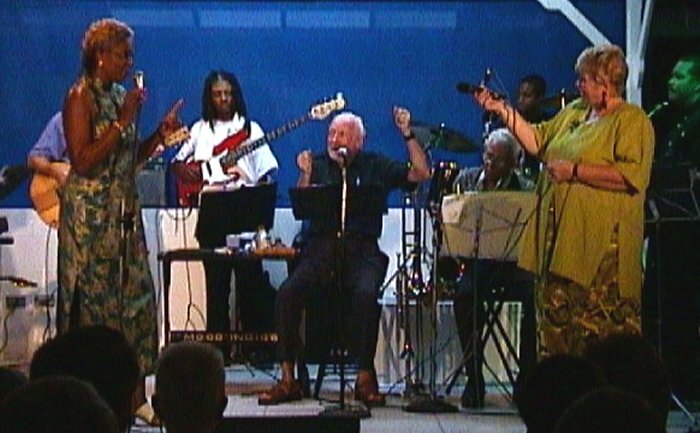 Joyce is on the left and David is seated behind the mike. The lady on the right, accompanying Joyce is the wife of the Canadian Ambassador to Trinidad, who is of course Australian. The others are boaters or boatyard staff. You get the idea, a rich intermingling. Our musical interludes also included a rare opportunity to sample the delights of the big steel band. Trinidad is proud to proclaim itself as the home of Pan, the only musical instrument they claim that was invented in the 20th century. 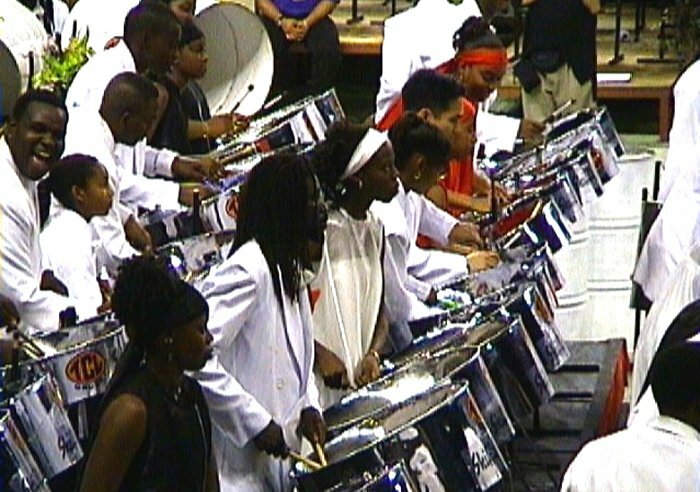 We managed to get tickets for the finals of the orchestral section of the World Steelband Festival in Port of Spain. There were eight bands, of around fifty players which included entrants from the UK, US, Finland and Switzerland. It was a fantastic evening of lively music and even more gymnastic players. Here's a picture of the winners playing their specially written "Rain Forest" by Boogsie a local composer. Another special event we experienced in Trinidad was the Hindu celebration of Divali, held on 26th October and known as the festival of lights. 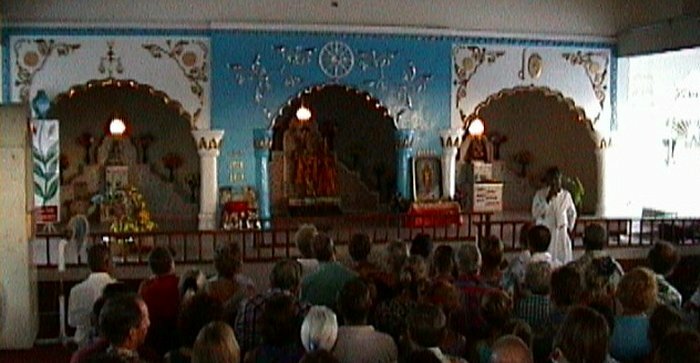 We visited the temple below to learn the basics of the Hindu religion and background to Divali from the priest, before going on to a typical festive meal at an Indian home. We were able to wander at will around the Felicity area, at the centre of the stupendous display of lights. Virtually every home and building was lit by festoons of light generated by oil lamps, candles and even electrons. Conditions permitting, we aim to head out to Tobago for a couple of weeks of R&R after the refit, then on to Grenada and the Grenadines. The trade winds can kick in anytime from late November onwards, making inter-island passages much more 'interesting'. The plan is to head for Cuba via the Virgin islands and Jamaica, then to the Yucatan coast of Mexico. We haven't decided yet where to hole up next summer, it could be on the US Eastern Seaboard or back down here in Trinidad. Either way we will be heading down for a Panama Canal transit early in 2002.